From the far North West we are propelled to the South East to view the good ship SS Fastnet. 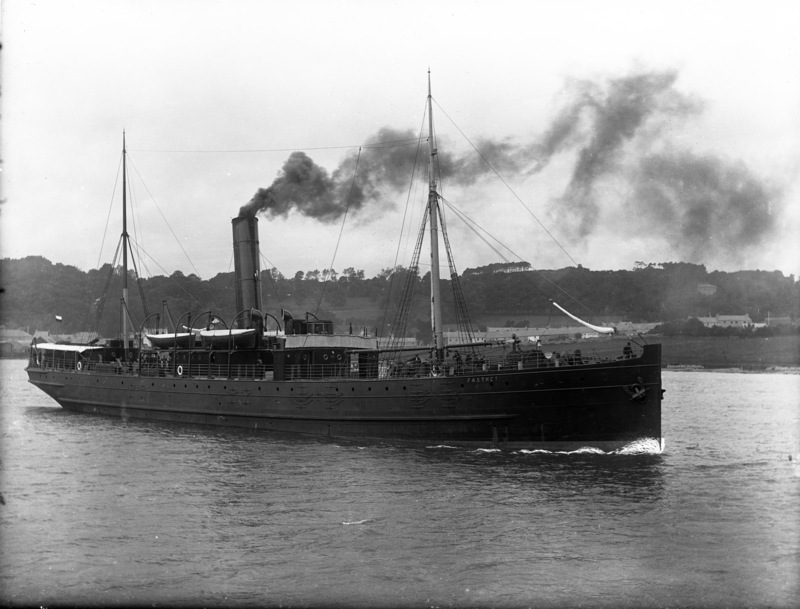 Mr Poole was a great man for photographing sea going vessels, the date range here is made for “narrowing” though we have found in the past that these ships can have very long lives themselves. I bet there is a Dog on board somewhere. Fastnet 135535 1914 616 Built as Allerton for West Lancashire SS Co, Liverpool, 1916 sold to Russell & Sons, Limerick r/n Monaleen, 1918 purchased by Clyde Shipping r/n Fastnet, 1923 sold to Henry & MacGregor, Leith r/n St. Abb's Head, 1953 scrapped. From - www.mariners-list.com/site_pages.php?page_name=Clyde+Ship... So between 1918 and 1923 . . . ?? [https://www.flickr.com/photos/nlireland] You are welcome Mary! When I was a child, I always thought ships were going backwards when the smoke went forward. It's complicated. [https://www.flickr.com/photos/beachcomberaustralia] Even more complicated as you are upside-down?